Allergan's Credit Rating Appears Safe -- Is Its Stock? Moody's reports it believes Allergan will maintain its investment-grade rating, but there could still be risk associated with buying Allergan's stock. Earlier today, credit-ratings service Moody's (NYSE:MCO) issued a report that says it believes Allergan plc. 's (NYSE:AGN) cash flow, and the potential for $36 billion in after-tax money tied to the sale of its generics business to Teva Pharmaceutical (NYSE:TEVA), will protect its investment-grade credit rating, except under certain circumstances. Despite Moody's assurances, shares in Allergan dropped today to new lows following the demise of its planned tie-up with big pharma giant Pfizer. 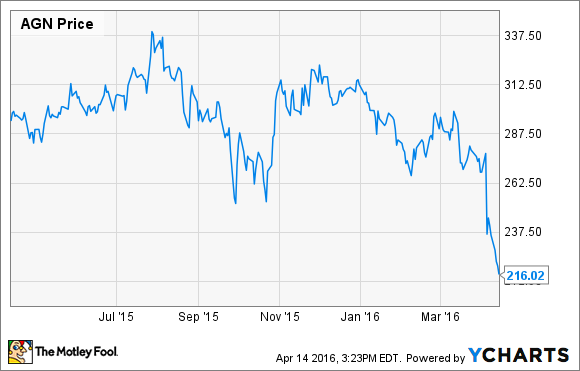 Is Allergan's financial picture really safe, and if it is, are its shares a buy? Allergan is a global pharmaceuticals company that has built up market-leading positions in eye care and treatment for central nervous system disorders, such as depression, and Alzheimer's disease. The company's $15 billion in 2015 sales, and low-tax Irish domicile, prompted Pfizer to agree to merge with it last year in a $160 billion combination. At the time, Pfizer cited Allergan's top-selling drugs, such as Botox, its product pipeline, and tax savings, as reasons for merging; however, after the U.S. Treasury Department announced new rules that would prohibit Pfizer from moving its headquarters overseas to cut its tax bill, Pfizer and Allergan scuttled their merger plans. Since then, Allergan's shares have fallen sharply over concerns regarding its $42 billion in debt, its limited cash cushion, and the potential risk that regulators could block its planned deal with Teva Pharmaceutical. Moody's indicates that it believes Allergan's financial situation is OK, as long as the deal with Teva Pharmaceutical goes as planned. Allergan agreed to sell its generic drug business to Teva Pharmaceutical last summer for $33.75 billion in cash, and $6.75 billion in Teva Pharmaceutical's stock. As a result, Allergan estimates that it will walk away with $36 billion in after-tax monies that it can use to reduce debt, acquire competitors, or fund share buybacks. Moody's says that Allergan could keep its investment-grade rating as long as it uses that money for small-to-midsize acquisitions rather than debt-fueled megadeals, and it avoids stock repurchases without a commensurate reduction in its debt. According to Moody's analysis, Allergan's credit rating could remain top shelf even if it spent as much as $30 billion on an acquisition, as long as the deal is financed largely with cash, and the company being acquired is EBITDA positive. The key to Allergan's rating, however, appears to be its receiving a cash windfall from Teva Pharmaceutical. In that regard, regulators at the Federal Trade Commission could be a fly in the ointment. Although regulators in the EU signed off on the Teva Pharmaceutical deal earlier this year, the FTC has yet to formerly give the two companies its OK.
Allergan's management is confident that it will get the regulatory go-ahead, and that it will close this deal before midyear. Until the FTC officially gives its blessing, however, investors are likely to discount Allergan's share price. Investors may not be totally off-base to think that regulators could balk at giving these two generics businesses a green light to combine. After all, generic drug price increases have drawn considerable fire in the past year, and regulators could view this merger as being too anti-competitive. That worry creates uncertainty that forces investors to consider how Allergan might fare if the Teva Pharmaceutical deal disintegrates. On that basis, its heavy debt load and $1.2 billion cash stockpile seem a bit lacking. Moody's report may also be dashing some hope of a big share buyback that could prop up its flagging share price. Nevertheless, Allergan's shares could offer investors opportunity if prices slide below $200, and get closer to its book value of $181. After all, Allergan's balance sheet will look a lot better if the deal goes through, and even if the deal falls apart, Allergan could still spin off the business in an IPO. Regardless, I'm content to sit on the sidelines for now until there's more clarity.